BFF - Breadfruit Forever? Or Breadfruit for Never? The day before we returned home to the Pacific Northwest we sat in a little cafe in Pahoa on Hawaii's Big Island kibitzing with fellow diners and reading the local papers. We realized that this should have been our first stop outside of our hosts' home when we first flew into Hawaii. The largest city on the Big Island of Hawaii is Hilo, but in reality Hilo is a small town. Pahoa is a village and many of the newspapers cover many of the little communities. In reading the ads and articles we found a number of places that featured music and entertainment. And we found two festivals that were happening the weekend after we left. We tried to get our buddies Donn and Debbie Irwin to attend both. One was enough for them. 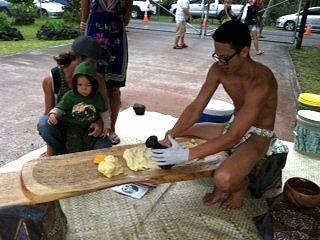 They chose the Second Annual Breadfruit Festival in Puna (Puna is the district where Pahoa is located). The last time we had been to Hawaii, Donn had refused to pick a breadfruit from someone's tree, even after I begged him and said, "Please." All I really knew about breadfruit was that it was a key player in the tale of the HMS Bounty. In 1789 the Bounty was sent to Tahiti where it took on a load of breadfruit plants and set sail for the West Indies. Perhaps, if they had sailed to the Sandwich Islands with their breadfruit the crew might have been more loyal. As it was, the crew mutinied and fled to Pitcairn Island. My father returned from Pitcairn with a carved fish. The fish had a place of honor on our walnut buffet. I've wondered about breadfruit ever since I was a young boy and heard the stories of the high seas and my dad's Merchant Marine activities during the Second World War. At the Sunday market, Donn and I saw what looked like a breadfruit, but when we asked, the booth owner called it jackfruit. Upon further discussion, we found that she was originally from the Gilbert Islands. I think she left before the Japanese invaded the islands. I knew that one of the bloodiest battles of the Pacific had been on Tarawa in the Gilbert chain. My father had probably supplied the ships that carried the U.S. Marines to the atoll in 1943. Donn referred to the lady as Tutu (grandmother in Hawaiian), a term of respect. She went on to explain that when breadfruit, which is similar to jackfruit, is cooked it tastes similar to potatoes. Pierre Omidyar, the founder of Ebay, along with his wife, Pam are encouraging people to eat and grow more breadfruit. An article in the Wall Street Journal, 'Food of the Future' Has One Hitch: It's All But Inedible, reveals, "The prickly football-size pod is full of nutrients and energy. Growing on one of the earth's highest-yielding trees, it could even help alleviate world hunger, backers believe. There's just one problem: It tastes remarkably bland." Like taro root, breadfruit must be pounded until it's a paste. If you've ever had poi, then you know that it's a highly acquired taste. With breadfruit you have to process the food and/or cook it before you can even eat it. To go along with the bland taste, the problem is that it's a starch and the starch will turn to sugar making a high calorie, bad tasting product. 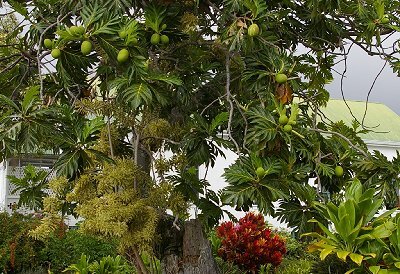 The Omidyars are trying to convince Hawaiian locals and other foodies to eat more breadfruit and spread the good news about the food, which grows prolifically in many different tropical locations. I wish I could have attended the Breadfruit Festival. I asked my buddy Donn if he was able to taste any. He responded, "Yep, I tasted the breadfruit . . . right off the board the young man was using to prep the stuff. It was . . . blah. Needs to be cooked with other stuff, kinda' like potatoes." 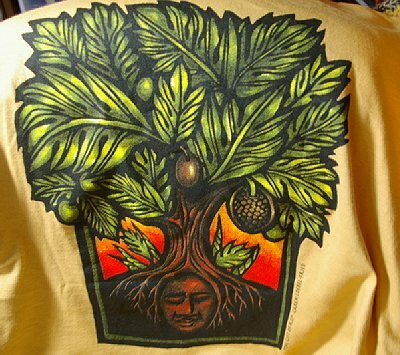 Our friends went to the breadfruit festival and all we got was the tee-shirt. Even after centuries of use, I think, for the modern palate, more work will need to be done before the acceptance of breadfruit in our diets. 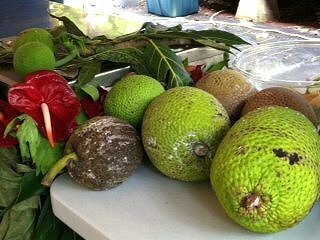 A fermented mash of breadfruit might be used in a tropical drink . . . maybe even combined with green tea, Teahiti Surprise? Perhaps, the Linus Pauling Institute at Oregon State University could conduct a study on the health benefits derived by steady consumption of the fruit. Or perhaps, Roman Meal could come up with "whole grain" breadfruit or a dynamite breakfast cereal, Coconut Breadfruit Toasties? Or how about Pineapple Breadfruit Pudding? The possibilities are endless . . . maybe . . . kinda. BFF - Breadfruit Forever? 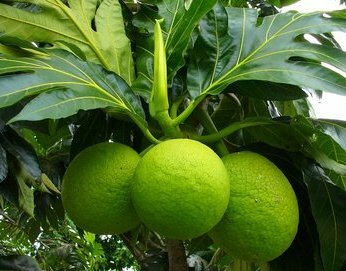 Or Breadfruit for Never?, breadfruit nutrition, benefits of breadfruit, free nutrition content article, Healthy Aging Article, Healthy Living Article.